I just got back from a flying visit to Cornwall… knowing the weather was set fair and the waves would be perfect I took the opportunity to head to St Ives for two days last week. Always my go-to spot for wave watching, Porthmeor didn’t disappoint 😊. I took far too many photographs… but I hold fast to my practice of only painting waves that I have seen with my own eyes! So I’ve plenty of fresh inspiration to keep me going. To mark the new year, the gallery walls have been given a stylish ‘Denim Drift’ make over to really set off the beautiful artwork. New displays have been ‘thinned’ a little just to give each item or picture space to be shown off to it’s best and really appreciated for the skill and creativity of it’s maker. There is a story behind every piece. 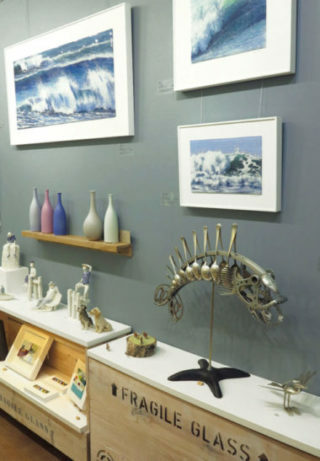 Our little container gallery is a delightful and inspiring space, an oasis in the city, where time spent is refreshing and a valuable reminder that we live on a beautiful island surrounded by stunning seas. Jane’s paintings, created with glass and enamels then kiln-fired, represent the sea in all its guises, and the medium is perfect for capturing the shine and reflection from the waves. The quest to capture that perfect wave, the colours, transparency, the unsentimental sense of nostalgia and memory, are satisfied by this striking and unique medium that Jane has developed over the years.